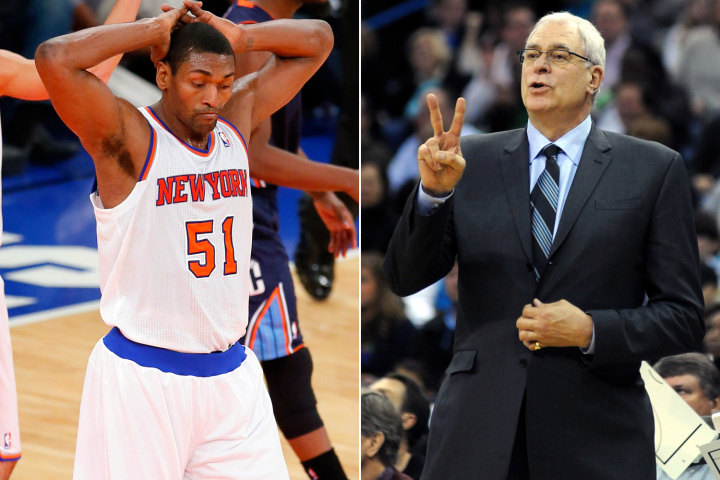 Does Metta Want Back In With Phil In Town? Metta World Peace, who played (or rather, rode Coach Woodson’s bench) for the Knicks earlier this season before asking for a buyout and being released, reportedly wants back in now that Phil Jackson is running the team. This story first caught some eyes when Metta told reporters he “absolutely” would NOT have accepted a buyout had he known that Jackson— with whom World Peace won a ring while playing for the Lakers— was coming on board. Today, CBS and the NY Post are reporting that sources close to Metta claim that he “abso-bleeping-lutely” wants another shot with the Knicks next season. Metta knows how to play defense, which means he could fill a need for this team. Jackson has specifically complained on the Knicks’ lack of perimeter defense and proper footwork. With Phil in and Mike Woodson almost certainly on the way out, this could be worth watching. This entry was posted in Articles and tagged KNICKS, KNICKS MEMES, Knicks news, knicks rumors, metta world peace, metta world peace come back knicks, metta world peace knicks, metta world peace knicks return, metta world peace phil jackson, metta world peace phil jackson knicks, metta world peace wants knicks back, phil jackson, phil jackson knicks, tommy rothman knicks on March 27, 2014 by Tommy Rothman.